BRIDGEWATER – It didn’t matter how many goals Christian Cuccinello put in the back of the net. After Saturday’s game the Mountain Lakes attackman, like the rest of the Lakers underclassmen, felt like he let his big brothers down. Rutgers Prep rallied from a 6-2 halftime deficit to stun Mountain Lakes 11-8 in quarterfinal round Tournament of Champions action on Saturday on the Basilone Field turf. Evan Lombardo fired a hat trick, Jack Vajde had two goals and one assist and Elliot Dennis scored twice for Rutgers Prep (19-2) in the Somerset private school’s inaugural NJSIAA boys lacrosse tournament appearance. 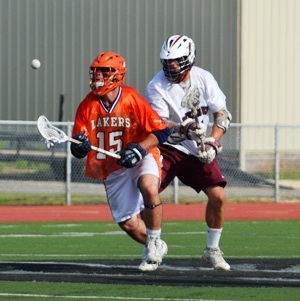 Cuccinello, a junior attackman, had five goals and two assists and Mike Sammarro, Chris Sammarro and Spencer Herman also had goals for the fifth-seeded Lakers. The first half was dominated by Mountain Lakes. Cuccinello had a hand in all six goals as Mountain Lakes carved up the Argonauts zone defense at will. Three of the goals were man-advantage scores, which seemed to fire up the private school team for its second-half charge. 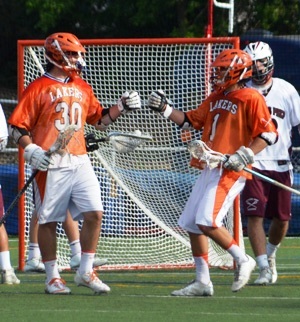 The Lakers had leads of 1-0 and 2-1 before the Argonauts drew even on a Vajda goal early in the second quarter. Then Mountain Lakes went on a 4-goal run to end the first half. Cuccinello is a basketball point guard during the winter months. 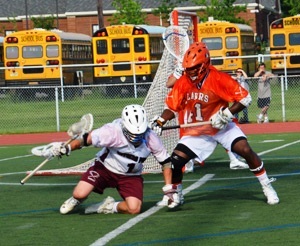 During lacrosse season, he uses his field vision and pinpoint passing skills to orchestrate much of the Lakers offense from the back of the cage. He scored three times in the second quarter and assisted on a Chris Sammarro goal with 5:04 left to make it 6-2 at the half. The second half for Mountain Lakes became a blur. In a 5-minute stretch between the third and fourth quarters, Rutgers Prep scored four consecutive goals. An unassisted score by freshman Breein Tyree on an athletic breakaway goal tied the game at 6-all at 10:09 of the fourth quarter. “We realized that we had to keep our heads and be able to come back,’’ Rutgers Prep senior midfielder Don Stephan said. “We worked our way back into it and got the win. 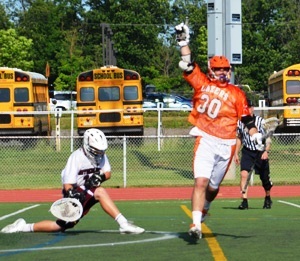 Stephan did his part by winning his share of draws against Mountain Lakes’ face-off specialist Sam Walsh. The reversal of fortune stunned the Lakers since the first half went pretty much the way they wanted it to go. Walsh, Zander Kotsen and Spencer Herman teamed up on a fast-break goal seven seconds after Tyree’s score in an effort to take momentum back. Herman’s goal made it 7-6 with 10:02 left in regulation. It was the last time the Lakers would hold the lead this season. Rutgers Prep scored three consecutive goals on shots by Tom Smith, Dennis and Lombardo to take a 9-7 advantage. Cuccinello connected on a lefty shot to the left corner of the net with 3:43 left in regulation to cut Mountain Lakes’ deficit to 9-8. However, it wasn’t to be. The Argonauts scored twice in the final two minutes to secure a trip to the T of C semifinals against top-seeded Ridge on Wednesday. Mountain Lakes (17-6) has a Group I state tournament title to be proud of and plenty of victories and fond memories to look back upon in the coming months. After walking to the South end of Basilone Field and taking a few minutes to regroup, the Lakers broke their huddle for the last time and were greeted warmly by their families and friends as they walked off the field together. The hunger and passion for more victories and thrilling performances will now cool to an ember for awhile before being stoked to start next year’s flame.